I’m posting something a little bit different today. This month, some of my favorite nail bloggers, Sarah of Chalkboard Nails, Sammy of The Nailasaurus, Rebecca of Rebecca Likes Nails, and Leslie of work/play/polish, joined forces to create the Lacquer Legion, which is aiming at bringing together nail artists and the nail polish obsessed on various social media. Each month, the Lacquer Legion will put out a challenge prompt, open to anyone who wishes to participate. All you have to do is post with the tag “#LacquerLegion” on Facebook, Twitter, or Instagram. This month’s theme is Reinvention. I like that it’s low-pressure and only once a month. I was pretty puzzled as to what I could to that qualified as “reinventing” until a bit of a happy accident earlier last week, when I ran out of cotton rounds in the middle of a snowstorm. Faced with my decaying mani and no way to remove it, I figured I might be able to “reinvent” it as something new and fresh by adding a few glitter gradients and some stamping. Somewhere in there I had visions of Tim Gunn telling me I needed to “edit”, but overboard is totally fine, right? 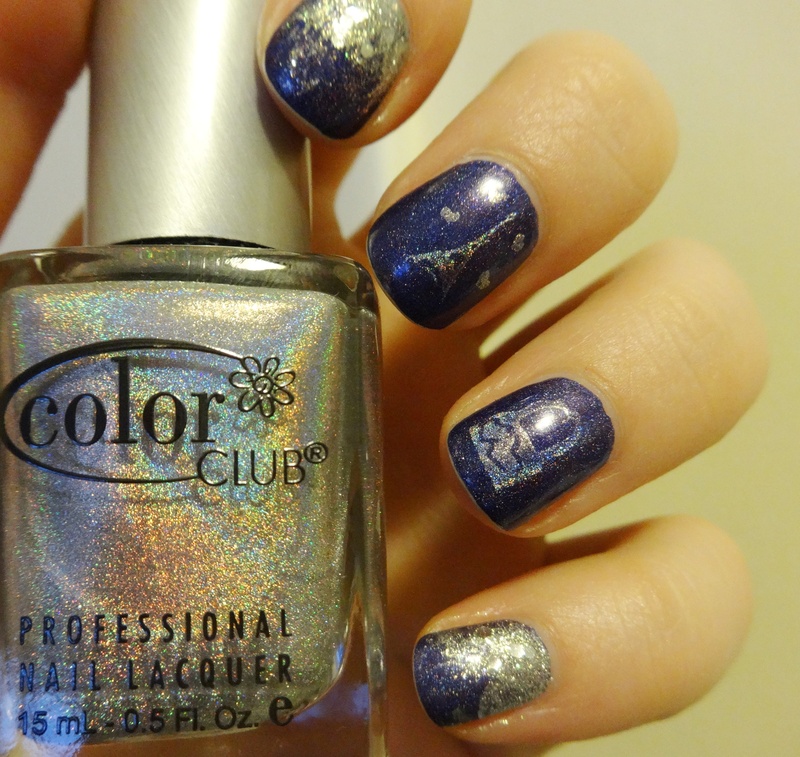 I started with my week-old Colors by Llarowe “Oops” mani (I got the Oops polish in a mystery grab bag from the Llarowe site, it isn’t part of her collection) and added a gradient of Maybelline Color Show “Silver Swank” (one of the Brocades) on the fingers with some chipping. Now you can’t see it, ha! Boom, reinvention. 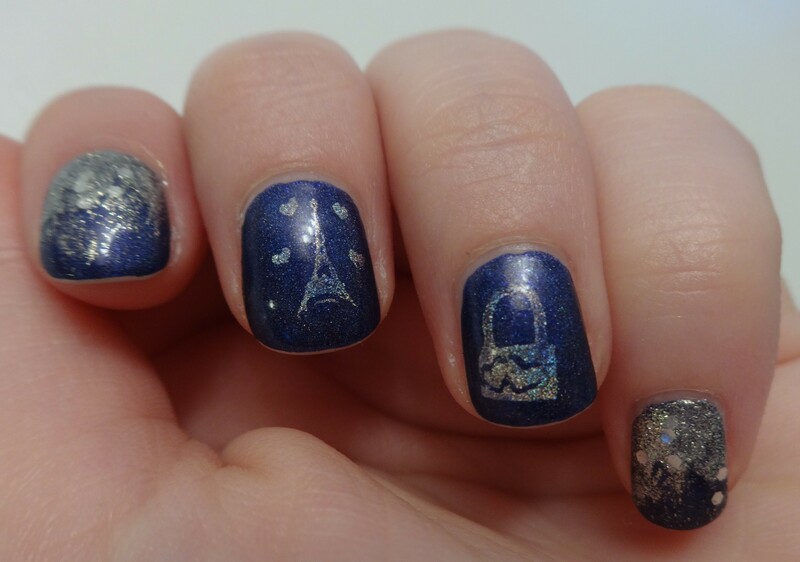 On the rest of my fingers, I tried my hand at stamping, using Color Club “Harp on It” and a MoYou Tourist plate (#3, which you can find at their site). I’m still just beginning at stamping, but I think it’s a lot of fun. Does that count as reinventing my nail polish skills? As proud as I am of the reinvention, the “pre-invention” was pretty lovely itself. I feel bad that “Oops” is sort of an unavailable color, since it isn’t really on sale, so I didn’t think it was right to post a review of it. However, I was just so smitten with it that I might have taken 60 or so pictures, and it’s a real shame not to share them. So I’ll add my thoughts on the polish as a non-review onto this post, with some of the photos. 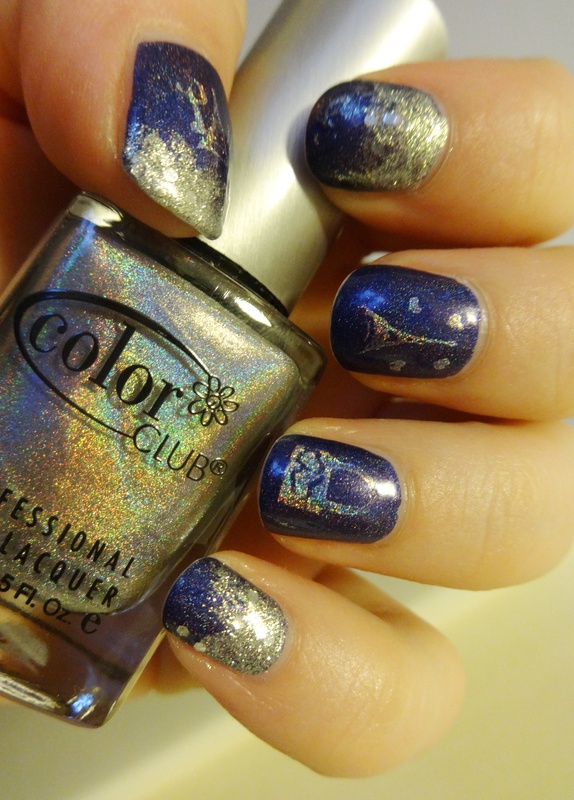 Colors by Llarowe “Oops” is a deep blurple (blue-purple) holo. Went on like a dream, completely opaque in one coat. 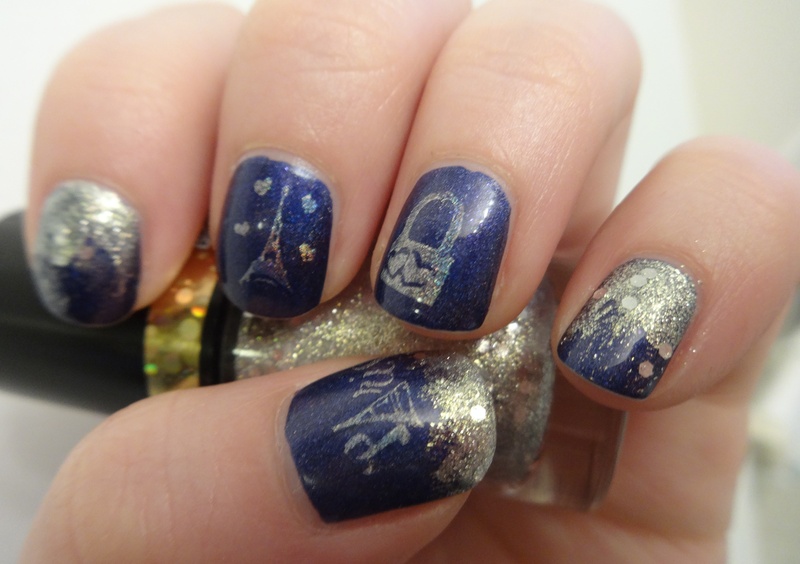 I actually did a double take painting the first nail, I was shocked at how opaque it was. Normally I’m all like “ehhh, maybe you could get away with one”, but if you could figure out a way to do half a coat, I’m convinced that would still be fully opaque. So smooooth. What is this magic? Yeah, I’ll buy whatever Llarowe puts out, even if it’s an accident. These pictures were taken on day two, and I ended up wearing it for nine days, including “reinvention”. 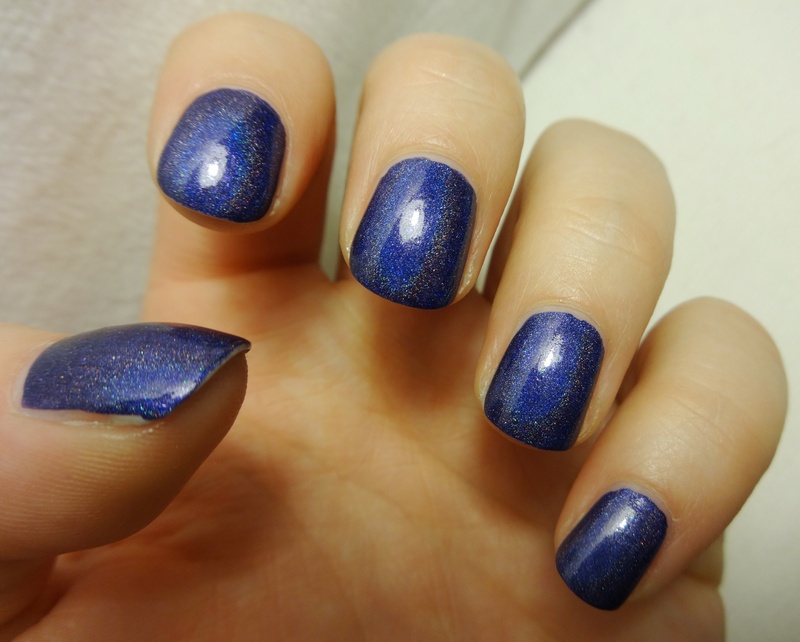 I wore it with one coat of HK Girl top coat on there and it held up well. So what do you think? 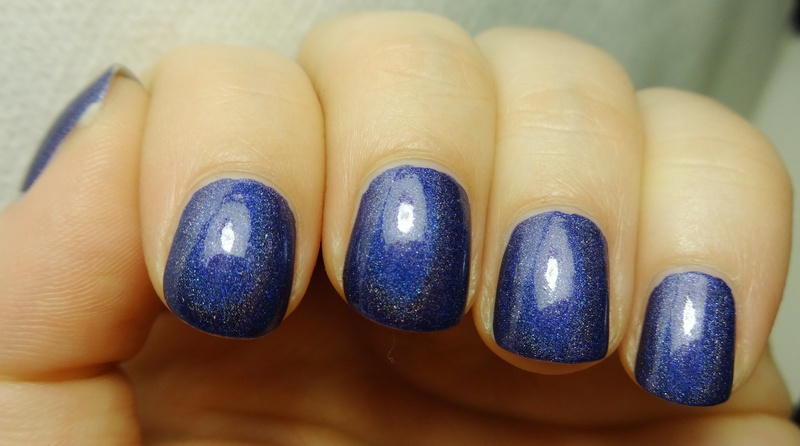 I think it’s pretty clear that I was head over heels with the polish, and the looming separation anxiety (combined with a snowstorm and convenient lack of cotton rounds) led me to stubbornly hold on by reinventing. Have you ever been so into a color that you didn’t want to change it? Have you ever just slapped another coat on and kept on trucking? Did I totally misinterpret “reinvention”?